All you need to play tennis is a racket, some balls and tennis shoes with non marking soles. Don’t have a partner? No problem. Want to learn the game? You are welcome to drop by our courts anytime. Our Tennis Centre staff will do their best to match you with a compatible playing partner. We can also arrange practice time on the backboard or with a ball machine. Rackets are available for you to use if you are new to the sport. If you find tennis to be your sport of choice, we have a well supplied Pro Shop to meet your equipment needs. Demo products are available and prices are MORE than competitive. Qualified staff will assist you in your choice of equipment. Instruction is available in a number of formats. Private or group lessons can be arranged with one of our Pros or you may sign up for one of the many clinics or group instructional sessions we offer throughout the season. 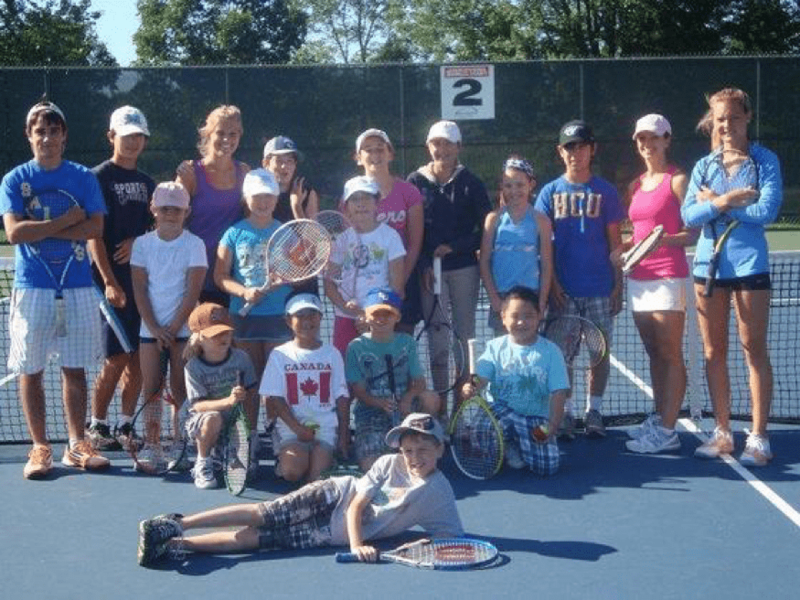 For Juniors, we run a number of programs both at our facility in Chapples Park or on many of the public tennis courts situated throughout the City. New tennis players are welcomed with open arms and our goal is to make the atmosphere as friendly as possible. Come check us out and you may find a sport you can enjoy for a lifetime! Tennis is known as the sport of a lifetime because anyone can play it despite their age and ability level. Tennis is a fun way to get exercise, socialize and exercise your brain as well as your body. Stop by our clubhouse to get some more motivation! If you’re new to tennis, there are a few things you need to learn before you can step on the court. Points in tennis are won when an opponent fails to return the ball, double faults, hits the ball into the net or smacks it out of bounds. Players start at zero (also known as love). The first point gives a player a score of 15. A second point moves their score to 30 and a third point makes it 40. A game is won once a fourth point is scored and the player has a two-point advantage over their opponent. Tennis play lasts until the match itself ends. Only 20 seconds can elapse between points and 90-second intervals are allowed between games to permit players time to switch sides on the court. Each player takes turns serving the ball and service switches from one player to another after each game. A player is required to stand behind the baseline when serving the ball. A serve begins when a player tosses the ball into the air and hits it diagonally across the net to the other player. If the ball does not cross the net or land inside the boundaries of the service box on a serve, this is what is called a fault. Two consecutive faults mean a lost point for the server. A fault can also result if a player crosses the baseline while serving the ball. A tennis match is divided into games and sets. In both men’s and women’s tennis, a player wins a set after winning six games. A player is required to win by two games, though, and a one game-margin will force a tiebreaker that must be decided by a two-game margin. Men’s matches play to decide best three out of five sets, while women’s matches decide best two out of three. Rackets range in price from under $50.00 to well over $300.00. There are many brands of rackets to choose from with each manufacturer producing rackets of varying quality levels. Beginners should choose a racket that feels comfortable in their hand and at a price range they are comfortable with. Most tennis players will own a number of different rackets over the course of their playing career. Because of their affordability, making racket changes as one’s ability level improves is an easy transition. There are several brands of tennis balls, but to the beginner, they are essentially all the same. Prices range from $3.00 to $6.00 per tin of three balls and can be purchased at most department or sporting goods stores as well as at the Tennis Centre. Tennis balls are sold in pressurized cans. Once opened, they lose their bounce over time. Recently, tennis ball manufacturers have begun making balls the are not “regulation” but have bounce characteristics that make playing the sport more enjoyable. Come see our Staff if you are a beginner and we can help you choose balls best suited to your ability level. Non marking soles on tennis shoes are a requirement at the Tennis Centre and at the vast majority of other tennis facilities. The side to side movement and the abrupt stops and starts of tennis movement can be a problem if the soles of a player’s shoes leave “skid marks” on the court. Appropriate tennis shoes can be found at most sporting goods shops, and our Pro Shop can custom order a wide range of tennis shoes.